Why should kids have all the fun? Here are advent calendars for you and some for kids! Chocolate is usually the first thing we think of when it comes to advent calendars, but what about Australian gin, whiskey or similar for adults? For kids, Lego, Smiggle or reusable options which you can fill with whatever you want can be a great option too. Here are our top picks, most of which support Australian businesses but be aware, some need to be preordered soon! Growing up, we had one which my mum made. It was a fabric Christmas tree with pockets. Each pocket had a lolly for each child and something nice we had to do that day for others to get in the Christmas spirit. If you’re after reusable advent calendars, Bed Bath And Table have a great range here. Or you could sew your own like this Sew Your Own Felt Advent Calendar: With 24 Mini Felt Toys to Make for Christmas . Not all of these options are ‘thrifty’ but they are fantastic! The kids options are more budget friendly. I love Christmas so am quite excited about the options below. A couple are affiliate links. You can read my full disclosure here. As much as I love junk food, something a little different appeals to me and most of my friends are getting the ones below. 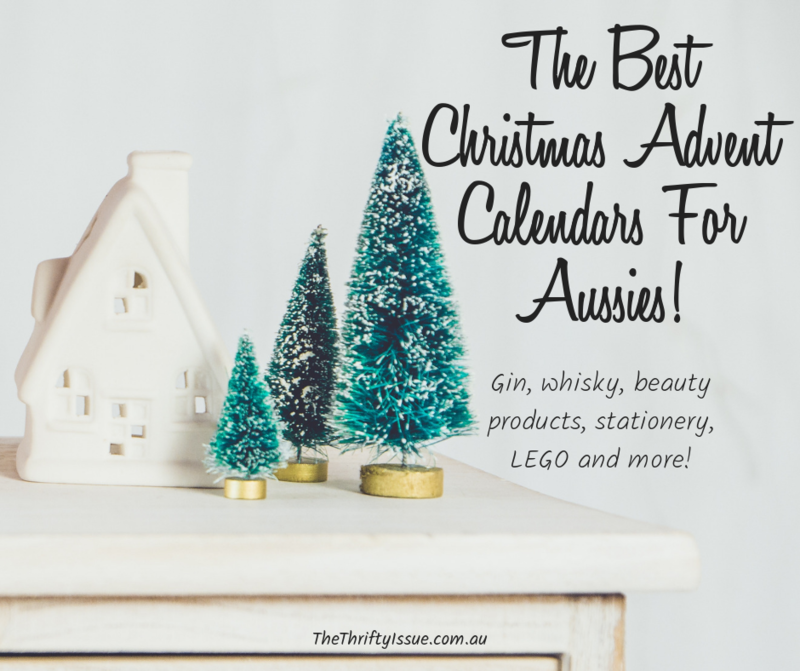 If you love a good whisky or gin and want to discover some great Australian ones, check out these advent calendars from Cocktail Kit! The whiskey advent calendar features 25 Australian whiskies with scratch cards to reveal more info about them. The gin advent calendar has 25 Australian gins and scratchies with info, including a gin from where I’m spending Christmas – the ACT! I love stationery and am so excited to see this one with Australian makers and creators. You only have a few weeks to order this one though! Since it is a preorder option, there aren’t images of all the stationery and items included but it is an incredible pack! Bath bombs, bubble bath, whipped soap, milk bath, bath salts and more are contained in this pack which is on sale and worth over $100! Alternatively, this Christmas 2018 by MAN’STUFF Cube Advent Calendar is a great cube of products for men! Get your family name on your calendar to use every year! I love this one because it is personal but also, the little shelves mean you can put anything on there e.g. matchbox cars, ooshies, lollies, chocolates or anything else your kid is into and it can be changed each year. My daughters have made the decisions here! They want them all, but of course, it’s not practical! They couldn’t decide between the LEGO friends Advent calendar , the LEGO City Advent Calendar and the LEGO Star Wars Advent Calendar. Can you tell we like LEGO? I love the LEGO ones because you can do so much with them. We play with LEGO all the time and have a huge collection so options like this work well for us. The hardest part is choosing which one! Because we all need more brightly coloured plastic things, right? I haven’t personally bought this one but it is popular at my kids school. You can check it out here. Christmas 2018 by Bomb Cosmetics The Bomb Advent Calendar – a range of bath bombs and products. Christmas 2018 by technic Winter Wonderland Advent Calendar – another beauty set in a winter wonderland theme. What do you do for advent calendars?